When you own a property with a flat roof, you need a roofing solution that provides exceptional protection against the kinds of abuse a low-slope roof is likely to withstand. 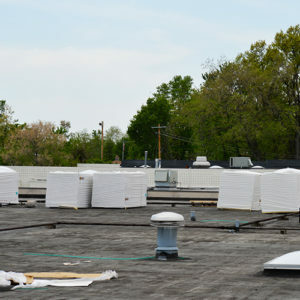 Flat roofing must be able to handle standing water, without slopes to help remove rain and snow from its surface; as well as heavy foot traffic, as maintenance teams work on HVAC systems and other areas of the roof. When you own this type of commercial property, your roof needs to be ready to handle almost anything! Since the 1970s, modified bitumen commercial roofing has been a top pick for roofers and property owners alike. One of the main reasons people opt for modified bitumen commercial roofing is its incredible durability. This means that modified bitumen is extremely protective against all types of weather. While it is good for protecting your property from rain and snow, the polymer modifications also make it an ideal choice for both hot and cold temperatures. This is an especially good choice for properties located in areas where weather is seasonal. Due to its incredible strength, modified bitumen is also long-lasting! Modified bitumen can easily last 20 years, which is a significant amount of time when you consider the types of traffic and abuse that modified bitumen commercial roofing is likely to sustain over a lifetime. Modified bitumen is also an affordable flat roofing solution. This is because of its easiness to install. The less time it takes for a qualified roofer to install a roofing system, the less it will cost the property owner down the line! Of course, you still want to make sure that your roofer is a qualified professional; cutting corners as a time-saving measure will only hurt you, the commercial property owner, later down the line. Improper installation can lead to leaks and an overall shorter-lifespan to your modified bitumen commercial roofing system.